With all of the restructuring that has taken place with Kansas high school football classifications, thankfully, Class 3A has a familiar feeling. It remains the only classification with a full 64 teams, and thus it is undoubtedly the deepest classification in terms of number of contenders. While other classes feature ranked teams with multiple losses, 3A still has eight undefeated teams after six weeks. There are the expected unbeaten with the likes of defending champion Silver Lake, Rossville, Scott City, and Conway Springs. Then you have some upstarts like Hutchinson Trinity and Horton; although the Chargers are still awaiting a first true test. Traditional playoff qualifiers Hesston and Norton are also off to unblemished starts. In addition to those seeking the perfect season, a dozen other teams carry just one loss into district play. While other classifications feel really top-heavy this season, it is comforting to have at least one division where several teams still have hopes of contending. Even if in the end they are all likely chasing Silver Lake. Horton (5-0) – Horton has rolled to a 5-0 start behind a defense that has only given up 26 points in five games. The Chargers had an open date in Week 2. Derek Richardson leads Horton with 797 rushing yards and 10 touchdowns. The Chargers haven’t reached the playoffs since 2008, and haven’t won a district game since 2009. Riverside (4-2) – The Cyclones are four points away from being unbeaten. Riverside fell 21-18 at Nemaha Central and 42-41 to Perry-Lecompton. Senior Andrae McGaughy was a Kpreps 3A All-State selection at defensive back a year ago, and is a dual threat quarterback that is capable of big plays. Sabetha (4-2) – Sabetha has won three straight games after starting 1-2 with losses to Nemaha Central and Holton. The Blue Jays have balance in the backfield in seniors Kegan Schumann and Brett Plattner. Sabetha has reached the playoffs in each of the past six seasons, but has finished above .500 only once during that span. Hiawatha (0-6) – After posting a 15-7 record the past two seasons and reaching the second round of the 3A playoffs each year, the Red Hawks are struggling in 2014. Hiawatha is winless and is being outscored by an average of 50 to 12 this season. Centralia (5-1) – After dominating their way to the 2-1A title a year ago, the Panthers move up to 3A this season. Centralia was unbeaten until last week’s 42-6 loss to No. 2 Rossville. Darrian Turner and Wyatt VanDorn lead the Panther offense with 1,009 yards and 724 yards, respectively. They have each scored 11 touchdowns. Nemaha Central (5-1) – The Thunder will try and reach the playoffs in its first year of consolidation with Baileyville B&B. As many as nine players from B&B’s title team a year ago are listed on the Nemaha Central roster. Nemaha Valley has reached the playoffs in each of the past two seasons in posting a 16-5 record. This season, the Thunder’s only loss came last week to Holton, 28-6. St. Marys (2-4) – The Bears have posted shutout wins over Marysville and Wabaunsee, but have been held scoreless twice as well. St. Marys’ losses have come to opponents that are a combined 19-5 this season. The Bears have reached the playoffs in each of the past 11 seasons. Rock Creek (1-5) – The Mustangs have only scored 58 points all season – 35 of which came in a Week 4 win against Wabaunsee. Rock Creek has been shut out three times this season. Key Games: (Wk 7) Centralia at Nemaha Central may decide both playoff spots. Maur Hill-Mount Academy (4-2) – After off to an impressive 4-0 start, the Ravens have dropped consecutive games to Christ Prep Academy (13-12) and Horton (28-0). The Ravens are led by junior back Harry Trotter who has 615 rushing yards and eight touchdowns. MH-MA has not made the playoffs in each of the past ten seasons. McLouth (3-3) – McLouth has posted a 23-7 record the past three seasons with consecutive playoff appearances in 2012 and 2013. This year’s Bulldogs have dropped three straight after opening the season 3-0. Their three wins have come against opponents that are a combined 3-15 this season. Pleasant Ridge (3-3) – The Rams may have put together their most impressive performance of the season last week in scoring in the fourth quarter to knock off previously-unbeaten Oskaloosa. Pleasant Ridge has reached the playoffs in each of the past two seasons, but lost in the first round. Atchison County (2-4) – The Tigers are 2-4 under former Doniphan West coach Nick Fuemmeler, but those four losses have come against opponents that are a combined 18-5. Atchison County is trying to end a two-year playoff drought. Key Games: All games are crucial in a fairly wide open district. Rossville (6-0) – The Bulldogs fell behind unbeaten Centralia 6-0 last week before scoring 42 consecutive points to win going away. Junior quarterback Tucker Horak is one of the state’s top players. He’s rushed for 1,001 yards and 13 touchdowns and passed for 815 yards and 11 more scores. Hoark is averaging 17 yards per carry. Silver Lake (6-0) – The Eagles returned the bulk of their defense from last season’s 3A title team and it has showed as they’ve only surrendered 14 points all season. Ryan Matzke has stepped in at quarterback to replace all-stater Dailin Kruger and has played extremely well. The Eagles are averaging 43 points per game. Oskaloosa (5-1) – Scott Whaley is one of the more underrated coaches in the state and his Bears were off to a 5-0 start before falling 24-18 to Pleasant Ridge last week. Luis Rodriguez leads Oskaloosa with 712 yards rushing and 12 scores. Dillion Grother and Justin Sharp have also been effective in rushing for 601 and 451 yards, respectively. Osage City (3-3) – Osage City won three straight games earlier this season, but has dropped its last two games. The Indians have not reached the playoffs since 2011. Key Games: (Wk 9) Silver Lake at Rossville. Look no further than the War on 24 to decide both playoff spots. Wellsville (4-2) – Wellsville’s two losses have each come by three points. The Eagles fell 3-0 in overtime to Prairie View in Week 1, and 19-16 to Eudora in Week 4. The Eagles are led by speedy back Brett Osbern who is well on his way to another big season after rushing for 1,246 yards and 15 touchdowns in 2013. West Franklin (2-4) – West Franklin has lost three straight games and been shutout in each of the past two weeks. The Falcons have never reached the playoffs since the formation of the school from the consolidation of Pomona and Williamsburg. Jayhawk-Linn (1-5) – The Jayhawks only win this season came 6-0 over winless Maranatha Academy. Jayhawk-Linn hasn’t reached the playoffs since qualifying with a 2-7 record back in 2009. Central Heights (0-6) – The Vikings have struggled this year in only scoring four touchdowns. Central Heights is being outscored by an average of 44-5. The Vikings have an eight-year playoff streak on the line. Key Games: Wellsville is a heavy favorite in this district, so all games matching the other three teams are key in deciding the second playoff spot. Northeast-Arma (4-2) – Coach Phil Hobbs continues a historic turnaround of the Viking program. Northeast posted back-to-back 4-5 seasons in 2012 and 2013 after winning just five total games the previous eight years combined. A playoff berth has still eluded the Vikings. Junior quarterback Drew Mills has rushed for 868 yards and nine touchdowns, while passing for 559 yards and eight scores. Antonio Slingluff has added 500 yards and five scores rushing after an all-state 2013 season where he rushed for 1,312 yards and 15 scores. St. Mary’s Colgan (4-2) – The Panthers are certainly battle tested having pulled off two one-point wins and another by four points. Colgan has dropped two consecutive games to ranked 4A-II teams in Frontenac (14-7) and Columbus (14-12). The Panthers are led by junior quarterback Ryan Cedeno and senior linebackers Nate Brown and Austin Commons. Humboldt (3-3) – The Cubs have posted consecutive wins over Eureka and Fredonia to get back to .500 on the season. Humboldt’s three losses have come to Tri-Valley League opponents that are a combined 14-4. Jacob Carpenter is one of the top players in the TVL. Erie (0-6) – The Red Devils closest game was a Week 2 loss at Oswego, 36-34. Erie has been outscored 246-62 this season. The Red Devils enter district play on a 20-game losing streak. Key Games: (Wk 9) Northeast at Humboldt will likely decide the second playoff spot. Caney Valley (5-1) – Caney Valley’s only loss came 35-21 to Independence out of the SEK League. The Bullpups have rolled through the reaminder of their schedule with no opponent coming within 26 points. Caney’s Levi Wyrick (6-4, 230) is one of the state’s top players. Neodesha (5-1) – Neodesha’s only loss came 20-14 to Cherryvale in Week 5. The Streaks have outscored their opponents 191-75 or an average of 32-13 per game. Mason Berryman rushed for 193 yards in the Streaks’ key 39-21 league win over Humboldt. Fredonia (4-2) – Fredonia started off the season a surprising 4-0, but has since dropped consecutive games to Burlington (23-6) and Humboldt (25-10). The Yellow Jackets’ four wins are the most by the school since finishing 5-4 in 2009. Fredonia last made the playoffs in 2006. Eureka (2-4) – Both of the Tornados wins have come via the shutout against winless teams in Yates Center and Erie. Eureka finished 6-4 in 2013 -- its most successful season in the past ten years. Key Games: (Wk 7) Neodesha at rival Fredonia will likely decide the second playoff spot. Cherryvale (4-2) – The Chargers hope to reclaim a bit of the 2013 momentum that led them to an 8-4 mark and a trip to the state quarterfinals. Cherryvale has dropped two of its past three games to Fredonia (32-27) and Caney Valley (33-6). The Chargers host Galena in Week 7 before road tests at Riverton and Southeast. Riverton (3-3) – First-year Riverton coach Ryan McFarland has the Ramblers playing extremely well. Riverton’s three losses have come to unbeaten Frontenac (20-7), unbeaten Columbus (33-14), and a tough Colgan team (23-22). The Rams have plenty of talent with big back Logan Edwards, standout athlete Landon North, and quarterback Dalton Weaver. Southeast-Cherokee (3-3) – The Lancers have won two straight games after dropping three in a row against the upper tier of the CNC League. Southeast has defeated Girard and Northeast-Arma in consecutive weeks. The Lancers are led by one of 3A’s finest players in running back / linebacker Ryan Rakestraw. Galena (2-4) – Expectations were high for Galena entering this season with so much returning from a year ago. The Bulldogs are off to a 2-4 start thanks to a brutal schedule. Galena has lost CNC games to Colgan and Frontenac by four points each, and been beaten by undefeated Columbus and 4A-I member Augusta. The Bulldogs are a dangerous team and have the talent in the backfield in Gabe Helton and Logan Johnson to still make a run. 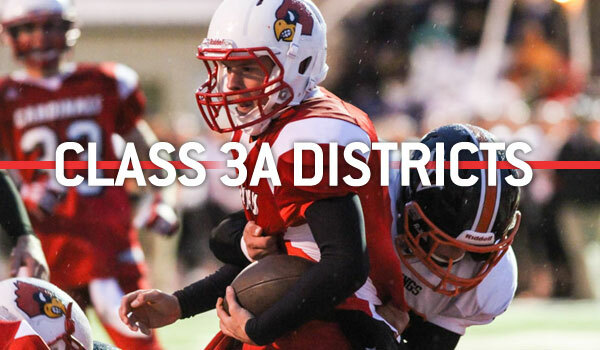 Key Games: All games will be crucial in one of the most competitive districts in Class 3A. Conway Springs (6-0) – The fourth-ranked Cardinals have rolled to a 6-0 start behind an offense that averages nearly 49 points per game. Luke Fisher leads the Cardinals in rushing with more than 1,200 yards and 24 touchdowns. He rushed for 250 yards and five scores in last week’s 42-21 win over previously unbeaten Wichita Trinity. Chaparral (5-1) – Chaparral is off to a 5-1 start thanks to a high-powered offense that averages 41 points per game. The Roadrunners lone loss came in Week 3 in a 53-46 shootout with Wichita Trinity. Quarterback Shawn Nulik has the potential to put up big numbers. Nulik rushed for three touchdowns and passed for more than 330 yards and three more scores in the loss to Trinity. Cheney (4-2) – After beginning the season 4-0, the Cardinals have lost two straight as competition has stiffened. Cheney battled turnovers in a 38-7 loss to Wichita Trinity in Week 5, and dropped a 27-0 decision to unbeaten Hutchinson Trinity last week. Running back Tyler Trego will try and lead the Cardinals back to the playoffs for the first time since 2006 – their only appearance in the past ten seasons. Belle Plaine (0-6) – The Dragons are battling low numbers and haven’t been competitive since a 15-9 Week 1 loss to Medicine Lodge. The Belle Plaine defense is surrendering nearly 48 points per game. Wichita Collegiate (5-1) – The fifth-ranked Spartans will be a heavy favorite in this district. Collegiate’s lone loss came 34-28 to 4A-II No. 1 Andale. The Spartans had to hold off Wellington 38-34 last week. Jaques Williams has rushed for a team-high 851 yards and 17 scores, while Austin Waddell has thrown for 605 yards and three scores. Douglass (2-4) – Douglass has beaten struggling Central Plains League programs Belle Plaine and Medicine Lodge handily. The Bulldogs’ four losses have come to opponents that are a combined 20-4. Leon-Bluestem (2-4) – Coach Kyle Wallis is beginning to see some progress in building the Lions program. Bluestem’s 7-27 record since the beginning of the 2011 season may not seem impressive, but it certainly is compared to the Lions’ 1-62 mark the prior seven seasons. This year’s team has posted blowout wins over Belle Plaine and Medicine Lodge. Wichita Independent (1-5) – The Panthers got their first win of the season last week, 41-8 over Belle Plaine. The defensive side of the ball has been the issue for Independent. The Panthers are surrendering nearly 46 points per game. Hutchinson Trinity (6-0) – The Celtics have been one of the state’s surprise teams in rolling to a 6-0 start behind a stout defense and strong running game. Trinity has surrendered only 34 points all seas (5.6 per game), while averaging 36. Elias Jasso-Cardenas has but up big rushing numbers and David Thibualt has been a nice compliment for first-year head coach Jordan Bell. Halstead (5-1) – The Dragons snapped a four-year playoff drought last season and look to get back to the postseason behind a strong rushing attack. Blake Beckett leads the Dragons with 1,149 yards rushing on less than 100 carries. Zachery Wright and quarterback Eli McKee are also threats out of the backfield. Kingman (5-1) – The Eagles made news around the state by posting four consecutive shutouts to open the season, while only scoring 43 points of their own. The streak snapped with a 21-8 loss to Hoisington in Week 5. Kingman is battling some injuries, but is looking to ride that defense to get back to the playoffs for a second consecutive season. Garden Plain (3-3) – Traditional power Garden Plain has alternated wins and losses to start the season. The Owls will have to find some consistency to avoid missing the playoffs for a second consecutive season. Keynan Wright and Grant Lehner lead the Owls in rushing with 344 and 333 yards, respectively. The each have scored five touchdowns. Alec Becker has passed for 555 yards and four scores. Key Games: This is appears to be an even district. Don’t be surprised if this one comes down to the point tie-breaker. Hesston (6-0) – The Swathers have done a fine job of replacing standout running back Ryan Schadler and are now 14-2 in the last two seasons. Senior Grant Raleigh has completed 79 of 121 passes for 1,208 yards with an 18/2 TD/INT ratio. He has also rushed for 932 yards and 12 scores. Council Grove (5-1) – The Braves have played the worst strength-of-schedule (SOS) in Class 3A, according to preppowerindex.com, and have outscored opponents 186-109. Junior Trey Langvardt has completed 50 of 100 passes for 673 yards with seven scores against four interceptions. Sophomore Braden Reddick has rushed 125 times for 740 yards and eight scores. Council Grove has faced none of the district opponents in the last 10 years. Southeast of Saline (5-1) – Southeast of Saline entered La Crosse’s 39-game regular season winning streak, then the state’s longest, in Week 4 with a 40-6 victory. The Trojans then lost to Beloit 44-7 the following game, but rebounded to defeat Ellsworth 41-0 last Friday. Senior lineman Aidan Murray is one of Kansas’ best players. Hillsboro (2-4) – The Trojans have fallen back since a 10-1 mark in coach Lance Sawyer’s first year in 2012. Since then, the Trojans are 6-9 and lost four straight from Week 2 to 5, including a 21-20 defeat at Smoky Valley two weeks ago. Hillsboro is 2-1 at home, but 0-3 on the road. Minneapolis (4-2) – The Lions got a signature win last week in beating traditional power Beloit, 27-26 in overtime. It was the second overtime game of the season for Minneapolis, which fell 13-12 to Sacred Heart in OT back in Week 2. The Lions have won three straight since a 33-29 loss to La Crosse in which they trailed big in the first half and almost rallied for the win. Washington County (4-2) –Washington County has average 45 points per game in its four wins, but been shutout in losses to Troy and Centralia. The Tigers are led by Andrew Tiemeyer who has rushed for 756 yards and nine touchdowns. Junior quarterback Konner Penning has thrown for 655 yards and five scores and rushed for 384 more yards and six scores. The Tigers are trying to reach the playoffs for the first time since 2010. Riley County (3-3) – Traditionally on the east side of the bracket with other Mid-East League members, Riley County makes the move west this cycle. The Falcons have won two straight after consecutive losses to ranked teams in Olpe, Silver Lake, and Rossville. Last week, the Falcons outscored St. Marys 38-30. Marysville (0-6) – Just six seasons ago, Marysville was the 3A state runner-up and won a combined 22 games in 2008 and 2009. Now, the Bulldogs are mired in a 29-game losing streak that dates back to Week 4 of the 2011 season. They’ve been competitive at times this season in an 8-0 loss to St. Marys and a 21-6 loss to Chapman, but opponents are outscoring the Bulldogs 37-6. Norton (6-0) – Norton has the No. 2 scoring defense in Class 3A at just 20 points allowed this season, six behind Silver Lake, No. 1 in the polls all season. Freshman standout QB Jace Ruder suffered a collarbone injury in Week 4 and last year’s signal caller, Jordan Dole, has returned under center after starting the year at fullback. Dole was 5 of 6 for 80 yards and two scores against Plainville in Week 5, and 4 of 13 for 35 yards and an interception versus Colby last Friday. Sophomore Jacob Green leads the Bluejays with 36 tackles, 10 for loss and two forced fumbles, all team bests. Beloit (4-2) – Last season’s state runner-up started slowly with a 26-0 Week 1 loss to Concordia, but the Trojans then reeled off four straight victories, all by at least 37 points. Colson Reames and Jace Adams each have at least 560 rushing yards. Beloit fell 27-26 against a solid Minneapolis team at home last week. Barring a major upset, the Trojans should secure a playoff spot for an eight consecutive season. Russell (1-5) – First-year coach Jeff Brull has gone through a tough season with the struggling Broncos. Russell’s lone victory was a 42-14 victory at Southwestern Heights in Week 5. Russell put in new field turf this season, a major highlight for the school and the town. Thomas More Prep (0-6) – The Monarchs have kept it close many times the last two seasons against top opponents and lost by five, eight, and five points in three straight games. However, TMP’s best player, senior quarterback Max Megaffin is injured and the Monarchs have lost the last two contests a combined 79-0. TMP hasn’t made the playoffs since 2002. Hoisington (5-1) –First-year coach Zach Baird has quietly delivered a nice season with the Cardinals, who are already better than last year’s 4-5 record. Hoisington lost 21-20 to Larned in double overtime in Week 1, and then have played great defense since. The Cardinals have won games by 7, 14, 29, 14 and 21 points and allowed just 32 points in the five-game winning streak. Hoisington has averaged 266 rushing yards per contest and just 10 passing yards a game. Sophomore Hunter Hanzlick has collected 75 carries for 536 yards and seven scores. Sophomore Landen Urban has collected seven tackles for loss. Ellsworth (3-3) – Ellsworth has matched last season’s win total with second-year coach Brent Schneider. The Bearcats have lost their last two games by a combined score of 56-7. The Bearcats have defeated Hoisington by a combined score of 64-30 in the past two seasons, but prior had lost four in a row between 2004 and 2009. Lyons (0-6) – Lyons had taken a big fall after a 5-4 season last fall marked the program’s first winning record since 2009. Lyons has lost eight straight to Hoisington dating back to 2004, and has dropped three of the last four games against Ellsworth, but won 40-33 last season. Opponents have outscored Lyons 173-32 this fall. Sterling (0-6) – Sterling has posted eight straight playoff appearances, but that streak could be in danger this season. Opponents have outscored the Black Bears 293-76. Sterling has played the No. 1 strength of schedule in Class 3A, according to preppowerindex.com, but has been competitive in just one game, a 21-14 loss to Haven. Scott City (6-0) – Scott City, which wrapped up the GWAC title last week, is in line for its seventh straight double-digit win season. The Beavers have delivered another outstanding season, outscoring opponents 266-44 against the classification’s No. 4 SOS. The Beavers own quality wins against Holcomb and Ulysses. Senior quarterback Trey O’Neil has thrown for 930 yards with 12 TDs, including his first interception of the season last week. Cimarron (4-2) – Arguably one of the best coaching jobs has come from Randall Rath, in his first season with the Bluejays, after he posted a 125-53 record at Oakley. Cimarron has already matched last season’s victory total and has outscored opponents 224-61. Last season, the Bluejays outscored opponents 288-250. The Bluejays had a huge 50-0 victory against Elkhart, a quality Class 2-1A team last week, and lost to Meade, 12-6, earlier in the season. Lakin (4-2) – Senior Caleb Seeger has passed for 770 yards with a 10/4 TD/INT ratio. Lakin has rushed for 201 yards and passed for 153 yards per game. The Broncs are 8-2 in their last 10 games with Cimarron, but have split the last four meetings, including a 41-0 Lakin victory last season. Lakin has won six in a row against Southwestern Heights. Southwestern Heights (2-4) – The Mustangs opened 2-2 with two losses by a combined 15 points. In Week 5, SW Heights took a surprising 42-14 defeat to previously winless Russell, and then fell 33-9 to Hugoton last week. The Mustangs have a 5/11 TD/INT ratio and 19 turnovers, compared to 26 in 2013. Key Games: (Wk 7) Cimarron at Lakin will decide the runner-up spot.